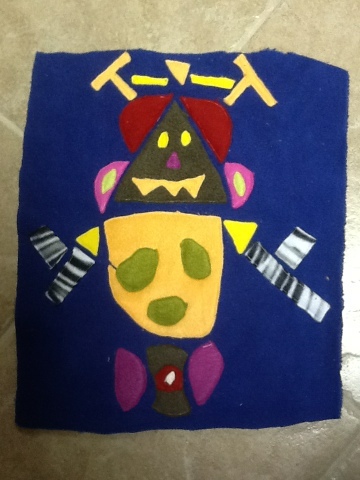 children’s art | ARTZCOOL'S BLOG! 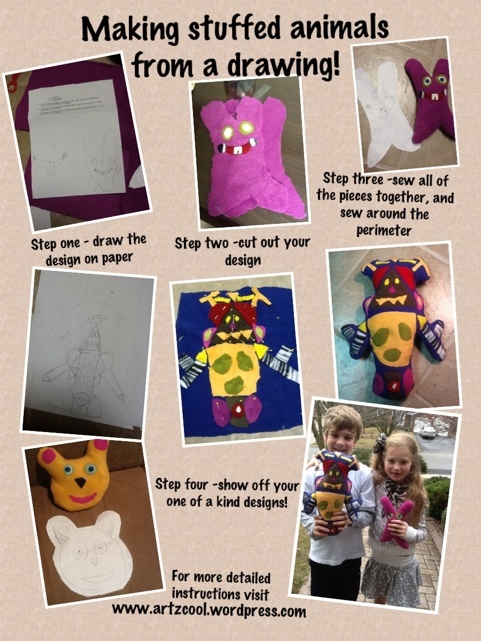 Stuffed animals from the kids drawings! I decided a few days ago to spell out the letters of Artzcool in whatever materials I am working with. 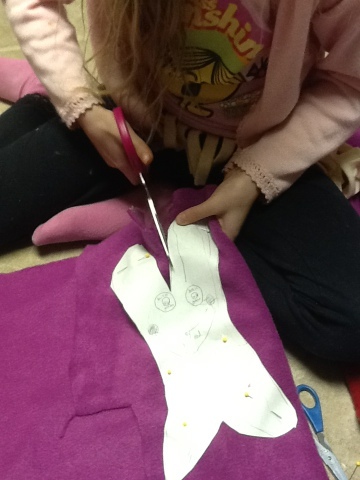 So today, the kids and I decided to try a sewing project using polar fleece. 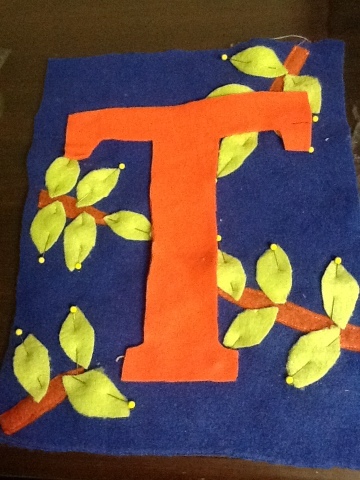 I was going to make the letter T, and the kids were each going to make a stuffed animal. 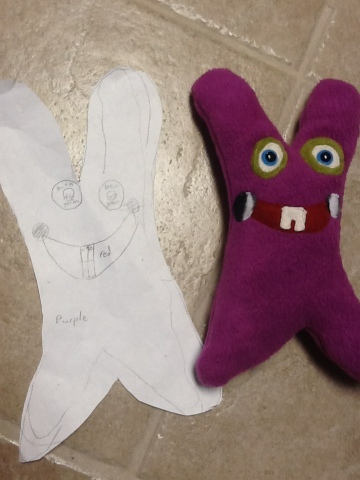 Here is Dylan’s first sketch and then his finished stuffed animal. 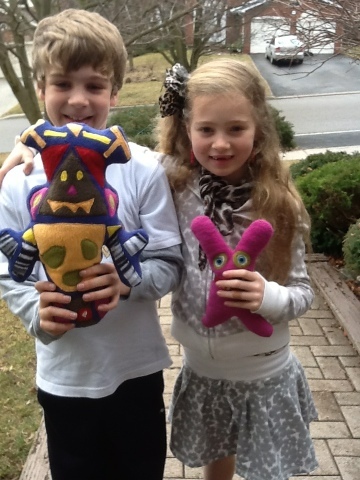 Dylan’s design was a little more complicated than Samantha’s, but the steps were basically the same. 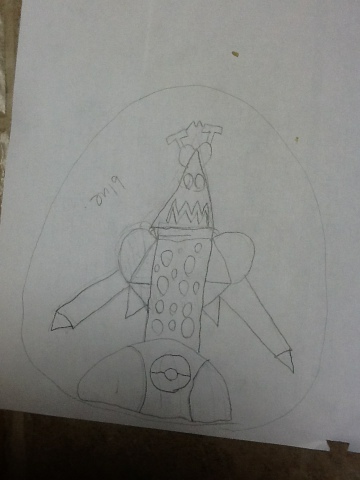 They both started by drawing a sketch. 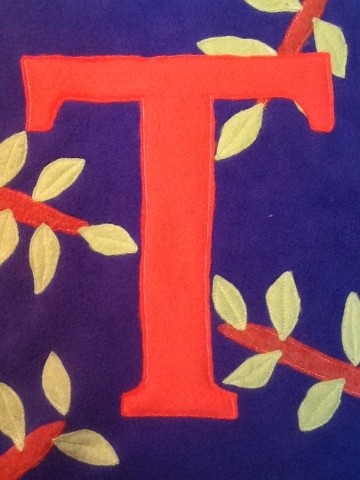 Sam cut out her drawing, and we pinned it to the fabric and cut it out, like a pattern piece. 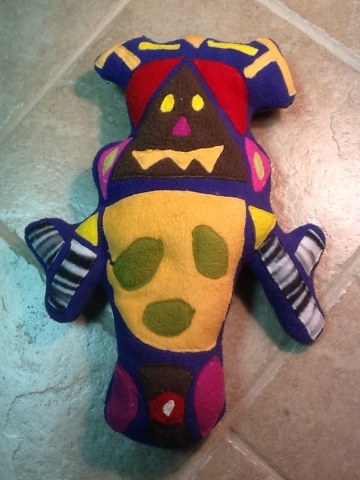 We figured that the best way to do Dylan’s design would be to attach all of the pieces to a background. 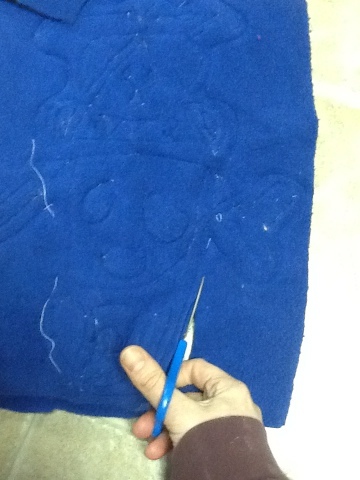 So, Dylan started by cutting out a blue square piece of polar fleece. Then the kids cut out all of the details they wanted to go on. 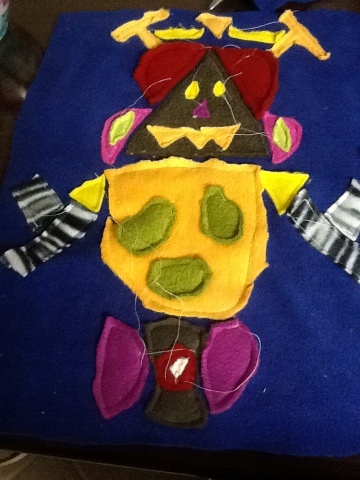 We talked about how it was like making a collage with fabric. 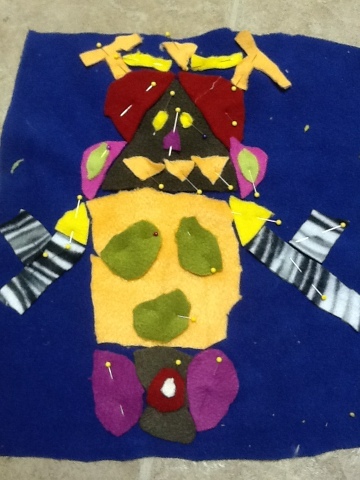 We pinned all of the pieces to the polar fleece. 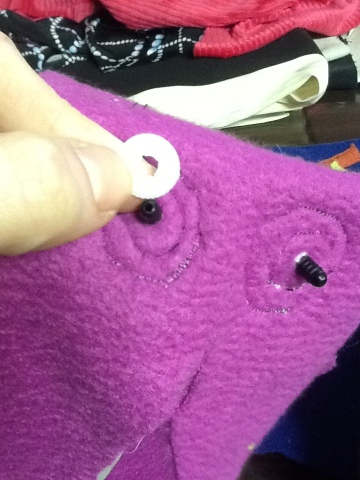 Then, I used my sewing machine to sew around the perimeter of each piece, and after sewing all of the pieces on, I trimmed each piece close to my stitching line… You can see what I mean in the picture below. With Samantha’s design, we decided to add some plastic eyes. To attach these eyes, I cut a tiny hole, poked the post of the eye through, then I attached the plastic disk on the back. 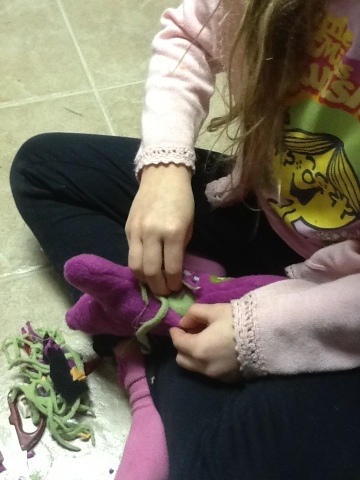 Then, for both of their stuffed animals, we pinned the right sides together and sewed around the perimeter. 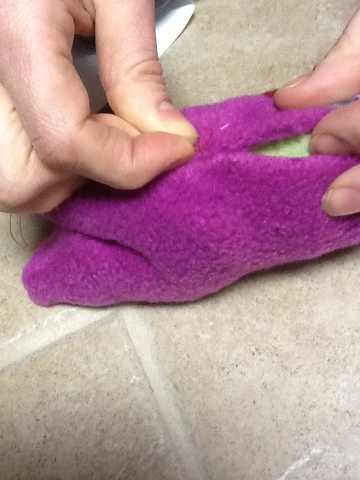 After sewing around the perimeter, we turned them right side out and stuffed them with our scraps of polar fleece. To finish them off, I hand stitched the opening closed.